Dr. Joia Mukherjee says her retirement plan involves buying a home in Cap-Haïtien, Haiti, with Père Eddy, the ordained Catholic priest and psychologist who favors tropical-print shirts and directs Partners In Health’s mental health program in Haiti. Her golden years will be filled basking in the warm Caribbean sun and his presence. Judging by the number of PIH staff who express a similar sentiment, they’d be wise to find a big house. Eddy Eustache, or Père Eddy as he’s most often called, is Haiti’s patron saint of mental health. 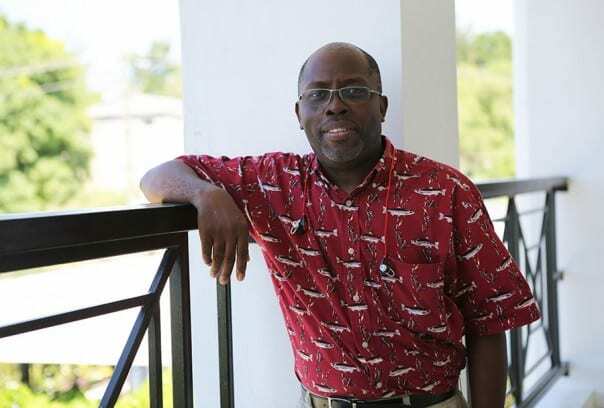 In the decade since 2005, when PIH (known locally as Zanmi Lasante) hired him as its first psychologist in Haiti, he has trained and expanded his mental health team to include 50 social workers and 13 psychologists who work in 12 clinics across the region. With guidance from PIH’s cross-site mental health team, led by Dr. Giuseppe (Bepi) Raviola, Père Eddy and his team have successfully delivered psychological care in some of the most impoverished regions of the country. Although Père Eddy maintains a low profile, his influence is global. For years, he traveled to Rwanda to care for PIH staff and victims of the 1994 genocide. He has spoken at international conferences from Toronto to Tanzania about PIH’s innovative, community-based model for mental health care. This month alone he hopped from Geneva to Beijing for conferences, brainstorming new ways to deliver mental health services on a global scale. His is essential work. The World Health Organization estimates that 14 percent of the global burden of disease is attributed to mental health disorders, yet most people affected (75 percent in low-income countries) don’t have access to the treatment they need. Raviola has nothing but praise for Père Eddy. Père Eddy found a home in PIH, where he’s combined his three passions—Catholicism, social justice, and medicine. As early as high school, he debated whether to become a priest or a doctor. He turned to the bishop presiding over his high school, Notre Dame in Grand-Riviere du Nord, for guidance. His advice? “’Become a priest first and then you’ll see about medical school,’” Père Eddy remembers him saying, as he shines a characteristic broad smile. That’s the path Père Eddy followed. In 1982, he enrolled in a Port-au-Prince seminary school and was a fervent student of liberation theology. After graduation, he served as chaplain of Cap-Haïtien’s all-girls Holy Cross High School and earned a spot as associate pastor in the local cathedral. He delivered passionate homilies about social justice to a receptive congregation tired of the nation’s political turmoil and crushing poverty. Père Eddy also became a trusted confidante of his female students, who shared long-held secrets of physical, psychological, and sexual abuse. “The students needed more psychological support than spiritual counseling,” he says. That led him to apply for a scholarship to St. Paul University in Ottawa, Canada, where he earned his master’s degree in psychology. He’s a true social justice champion. The Haiti Père Eddy left in 1991 was anything but stable, and his students already felt desperate about their future. When he returned with his degree one year later, following a coup d’etat that ousted President Jean-Bertrand Aristide—a fellow priest and out-spoken social justice warrior, his students’ hopes had been destroyed. Père Eddy threw himself into his work. He returned to Holy Cross to minister, in more ways than one, to his students. He began teaching at his old high school, and started producing radio and television shows about adolescent mental health. Then another coup d’etat in 2004, which again ousted the re-elected Aristide, rocked Port-au-Prince. Père Eddy says the capital “was like a big cemetery;” violence was high, car-jackings were a regular occurrence, and people were attacked in the street. Around that time, a friend asked him to work for Catholic Relief Services to support staff who were dealing with high levels of post-traumatic stress. He agreed, splitting time between the capital and the organization’s southern branch in Les Cayes. That’s where Fernet Leandre found him in early 2005. At the time, Leandre was director of Partners In Health’s HIV and tuberculosis program in Haiti and facing a crisis. His patients were dealing with deep depression, and occasionally psychosis, as a side effect of their treatment. Those battling tuberculosis went through long periods of isolation, sometimes up to 24 months; their toxic drug regimens initially made them feel worse; and they couldn’t work while sick, which meant their families sank into abject poverty. Patients diagnosed with HIV faced stigma, social isolation, and were often abandoned by family and friends. Leandre didn’t have the mental health expertise to help his patients, but he knew someone who did. He and Père Eddy were childhood friends, having attended the same elementary school. They spent their time playing sports (although, Leandre says, his friend wasn’t the smoothest soccer player) and sharing meaningful conversations about their futures, and the future of their country. Although their paths diverged at high school, they kept in touch. who now lives a full life in Haiti following treatment for his mental illness. Père Eddy was in. Starting in September 2005, he traveled to every PIH clinic to work with tuberculosis and HIV patients who were learning to live with a chronic illness. He trained social workers how to meet their patients’ psychological needs. And he counseled staff who felt burdened by years of bearing their patients’ pain. Père Eddy understood it so well, in fact, that PIH sent him to Rwanda in 2006 to counsel traumatized staff and women who had contracted HIV after being raped during the genocide. (Some estimates say as many as 250,000 women shared this horrific experience, in a country with only one public psychologist.) For several weeks every year, he returned to help staff and patients deal with the recurring trauma around the genocide anniversary on April 7. In 2009, Père Eddy and Raviola met for the first time in Rwanda, where they collaborated to get a new mental health team off the ground. Together they forged a strong friendship and professional partnership, based on the commitment to integrate mental health services in every country where PIH works. Then disaster struck in Haiti. On January 12, 2010, a 7.0 earthquake shook Port-au-Prince, resulting in more than 300,000 dead and thousands more injured. In the days following the disaster, Raviola joined Père Eddy to plan a coordinated response. One of his primary concerns was the impact on PIH staff, many of whom were working when the earthquake struck and couldn’t immediately return to Port-au-Prince to check on family and friends. When they did, many learned their loved ones had been buried alive in rubble. The tragedy denied victims a proper burial, and survivors a well-needed mourning process. So Père Eddy created one. He, Raviola, Mukherjee, and Leandre traveled to each PIH clinic and conducted memorial services in honor of those who had died. He wove religious, spiritual, and mental health messages into his sermon-like presentations. And he encouraged staff to cry, mourn, and seek individual counseling themselves. Many, Leandre says, took up the offer. The presentations were later used by PIH community health workers in settlements for displaced people and were adopted by the Haitian government to help mourners nationwide. Père Eddy had long lived a “peripatetic existence,” Raviola says, traveling around Haiti with a small suitcase of his possessions and multiple cell phones ringing. He became adept at holding two conversations, with a phone at each ear, as he served patients or mentored and supported staff. The post-earthquake period intensified that experience. In some ways, the earthquake was a wake-up call. “We always say HIV was our battle horse for building primary health care” in Haiti, Mukherjee says. “The battle was never about HIV itself; it was about using the interest, the money in putting together systems for primary health care. The Haiti team was well-positioned to take a stand. Père Eddy and Raviola expanded the team so that one psychologist was based at each clinic. A top priority was tackling widespread depression. Raviola—a psychiatrist by training with clinical, global health, and systems experience—recruited some of the best minds in his field to create a culturally appropriate depression screening survey for community health workers. Père Eddy trained his staff how to use the tool to identify community members at risk. The workers then referred those in need to a clinic or hospital, where a psychologist would assess them, begin counseling, and—if necessary—refer them to a physician to prescribe medication. Meanwhile, Raviola worked on adding at least one trained psychiatrist to Père Eddy’s team. He developed the Dr. Mario Pagenel Fellowship in Global Mental Health Delivery at PIH and Harvard University for early-career psychiatrists interested in global mental health. The first fellow arrived in Haiti in 2011, and more have since cycled through to reinforce the team. The community-based model was groundbreaking in global health circles for providing long-term care in a challenging setting. The Haiti team applied for a Grand Challenges Canada innovation grant to expand their program to cover a range of mental disorders, including depression, epilepsy, psychosis, and child and adolescent mental health problems. They got it. When they reapplied last year to expand the program from all PIH sites to across the country—now in collaboration with the Ministry of Health—they landed it again. Because of staunch advocates like Père Eddy, the mental health programs in Haiti and Rwanda demonstrate what is possible in some of the poorest places in the world. But the priest-turned-psychologist doesn’t take this as a sign that his work is done. In some ways, it’s just begun. Guess that retirement house in Cap-Haïtien will have to wait.